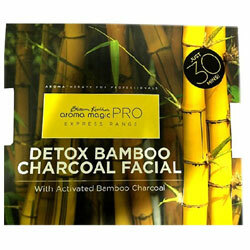 Aroma Magic Pro Detox Bamboo Charcoal Facial With Activated Bamboo Charcoal - Deep cleans, tightens pores, brightens & smoothens skin. Removes dead skin cells, moisturises and tightens the pores. Activated Bamboo Charcoal deep cleans and absorbs minerals, toxins, impurities, and other harmful substances from your skin, leaving behind a smoother, brighter skin. It is natural exfoliant that removes dead skin cells, moisturises and tightens the pores. It is an effective, natural treatment for skin with rashes, acne and pores clogged with exposure to pollution. Bamboo is antibacterial, anti-viral, anti-fungal and antimicrobial. As a result, this kit is ideal for people who are exposed to fungal, viral and other bacteria based problems resulting from the environment. Detox Bamboo Charcoal Facial is an exceptional contribution to and a unique preparation for the salon and spa industries. This facial is a 3 step professional treatment that takes just 30 minutes! Formulated with activated bamboo charcoal this formulation is immensely effective in enhancing the quality of the skin as a result of deep cleansing. Clean face gently with ABC Cleanser for 3 minutes. Wipe off with damp cotton. Place damp cotton pads over the eyes and eyebrows; take one pouch of the ABC Mask in a bowl, add water to from a paste. Apply a layer all over the face and neck. Leave it on for 15-20 minutes and peel it off the face gently. Wipe off with damp cotton pads.. Massage the face gently with dry fingers for 3 minutes and wipe off. Massage the face for 3 minutes with 1 ampoule of ABC Concentrate. Without wiping the concentrate, apply sunscreen to ensure protection. what we apply should be as healing and natural as what we eat.